McLeod's first Moneybunny book featured a little girl bunny who wanted to be a famous singer but learns that hard work is the only way to get anywhere. The next title, featuring a little boy bunny named Sonny, clicked with me much more and it's one I can see recommending frequently to parents. Sonny, an exuberant gray bunny with a striped shirt, blue shorts, and long ears, gets his allowance of three carrots every Saturday. He wants to buy EVERYTHING but he doesn't have enough carrots. His mom calmly tells him he will have to make a choice about what's important and goes back to raking leaves. Sonny does some basic math - he wants three things, he has three carrots, but his mom tells him he has to think it through a little more! The things he wants cost more than one carrot each. After some hard though, he decides on a pogo stick, which costs three carrots, and is happy with his choice. This is a very simple introduction to the concept of buying things. The simple illustrations are humorous and don't detract from the lesson of the story, that Sonny has to make a choice about what he will spend his money on. Of course, the concept can be a lot more complicated, especially for kids who don't get an allowance, but this is a good, easy introduction for preschoolers about how money works. Future titles will cover saving and giving money. Verdict: There are very few picture books covering money for the preschool crowd. Match this one with Lemonade in winter and Pretty Penny (now out of print) for a good beginning lesson on handling money. I'm always fascinated by migration and this is a beautiful and simple look at this complicated subject. 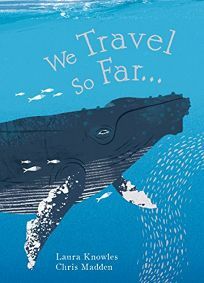 In poetic language, Knowles introduces the great journey of migration and the stories of the creatures that undertake these epic journeys. Each spread introduces a different creature and is illustrated in sharp detail by Madden art that focuses on the creatures and their natural surroundings. The migration of the sockeye salmon shows a group of red fish, determinedly leaping up frothy white falls as hungry bears lunge across the page. The monarch butterflies' page explodes in color and life as orange butterflies pour across a green and blue background. Fruit bats spiral up from the trees in Kasanka National Park, where they have migrated to feed on fruit. A close-up shows a sweet, furry creature peering back at the reader. Arctic terns glide across a cold, grey-blue page, "We are the arctic terns, the daylight dancers./We chase the summer, pole to pole." 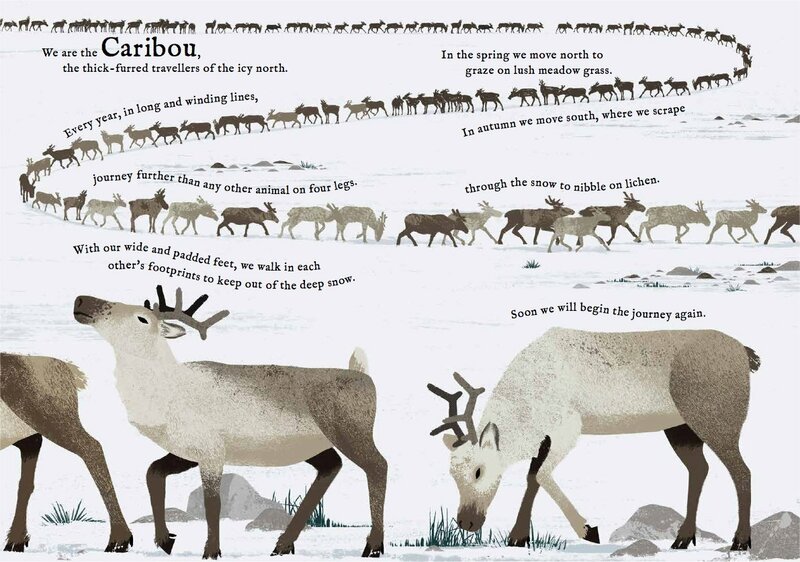 The book ends with a spread showing a diverse group of people and repeating the refrain, "We travel so far." that has been reiterated throughout the book. Just like the animals, humans travel for safety and food, but also to find freedom and adventure. Back matter includes a world map (the migrations are not marked on it) and data about the land and sea migrations. Verdict: A beautiful and informative book, a great addition to school curriculums and for reading aloud in sections and discussing. Technically this is a board book, but it's a more complex concept than the average board book. However, it's not really a picture book either, since it has the traditional format, in some ways, of a board book. 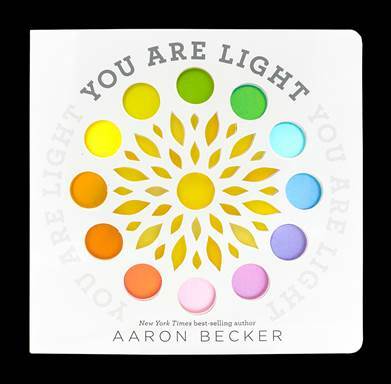 The die-cut circles on the cover are repeated throughout the book, with some blank and some having colored, thin vinyl behind them. The colors shift throughout the book, so you get a different set of colors as you hold it up to the light. The pattern of die-cut shapes in the center of the cover are repeated in flame-like colors throughout the book. The accompanying text at first seems poetical, but a more careful read shows that it actually takes readers through the water cycle and how light effects it. The text is abstract and the light plastic coverings on the individual circles probably won't stand up to vigorously poking little fingers. However, it's a lovely book with rich language and a unique design that will attract kids of a variety of ages. I'm not sure why I thought it was a good idea to do two conferences in quick succession, along with our annual big collaborative event and the art show... it seemed like a good idea at the time? Anyways, I'm done with CE for the year now (except two local things). We had about 200 people come through for the art show Monday night and then on Tuesday all the 4K directors came in for set-up for the big train party. I'm desperately trying to finish another chunk of weeding before I'm gone-ish next week. I've seen a lot of enthusiasm and love for Peirce's new book, including blurbs from Pilkey and Kinney, but frankly when I heard about it I thought it sounded weird. Now that I've read it, I still think it's kind of weird and there are going to be SPOILERS ahead because I can't talk about it without exposing the big twist halfway through. So, the story is framed as Big Nate hands in a book report on Max and the Midknights for his "history" report. The story itself is done in the same graphic blend/notebook novel style as Big Nate and the art style is the same as the Big Nate cartoons. The story opens with Max and Uncle Budrick traveling the countryside as troubadours. Max, however, doesn't want to be an entertainer, especially not one who's as bad as Budrick. After they're robbed and Max uses Budrick's broken lute to knock out the robber, they arrive at Budrick's home city of Byjovia. Budrick explains that there people are required to follow the trade of their father and he didn't want to go to knight school so he ran away when he was ten. But he assures Max that everyone in the city is friendly and kind, due to the good rule of King Conrad. Turns out, Conrad is gone and his treacherous and evil brother Ghastley has taken his place. Uncle Budrick is hauled off to be Ghastley's fool, his alternative being a dungeon or execution, and Max is revealed as a girl, and declares her intention of being a knight. With the help of a rather bumbling magician, two street children, and another new friend, Max and the Midknights set out to save Uncle Budrick, defeat Ghastley, and break the evil spell on the city of Byjovia. The book is a weird mixture of medieval history and contemporary language and attitudes. Things like children following in their father's profession, the limitations on girls, being jailed for being a vagrant, and beliefs in wizardry and magic blend with the sometimes incongruous attitudes of the characters, using slang and making jokes like picking up a book of prophecies at a yard sale, etc. I'm not familiar enough with medieval history to recognize all the parts that are accurate though; were medieval people familiar with zombies, for example? There's also a very contemporary attitude throughout; after some initial surprise, Max's gender nonconformity is quickly accepted (a secondary character agrees that boys' clothes are easier to fight in) and King Conrad allows her to attend knight school. To some extent, I felt there were a lot of stereotypes in the characters. Max is a spunky redheaded girl, the pudgy boy is nerdy, liking stories and making books and always looking for food. One of the street children she befriends is black, but is almost completely silent throughout the book and only at the end does he suddenly declare his own intention of being a knight with Max, although no prior discussion of his interests was made. The pudgy boy's father has a wooden leg and is shown as a child with it, so presumably something he was born with (although missing limbs would have been more common in medieval times I would guess and that's not even approaching the whole medieval attitude towards birth defects or deformity of any kind). One major historical incongruity was the complete lack of religion of any kind; there are no churches, priests, or anything similar mentioned or shown. Verdict: It's funny yes, and I think Big Nate fans will pick it up, but the inconsistencies really made me uncomfortable and I'd hate to think of any kids, like Big Nate ha ha, using this as a guide to medieval history. In the end, it's just a fun book that probably won't have the wide appeal of Big Nate but will surely check out regularly. Readers who have previously encountered Spike the dinosaur and his duckling siblings, Feather and Flap, will be delighted by their next funny adventure, this time in easy reader, rather than picture book, format. Winter is full of surprises and Spike can't wait to experience them all! Skating, sledding, building snowmen, he wants Feather and Flap to join him for everything. There's just one problem - Feather and Flap are really, really cold. Much too cold to play outside, even if they want to. Can Spike come up with a special surprise that will let the siblings play together? Bright, colorful cartoons illustrate this predictable but satisfying adventure of the Ugly Duckling family that accepted their own odd duckling (or dinosaur as it might be) and created a family all their own. This is the lowest reading level of the I Can Read! imprint, My First Shared Reading, but it still comes in at a guided reading level of E, and a lexile of 260. This would be what I'd give a red sticker and call a first level reader, usually for 1st graders and some kindergarteners. It's not a true emergent easy reader, those are few and far between, but it's certainly a good choice for kids who are ready for sentences and multi-syllable words. Verdict: A silly and fun book for beginning readers. Recommended. I do love Schwarz's cats. After several popular and beloved (at least in our library) picture books with flaps, pop-ups, and other elements, Schwarz eventually returned to the smallest of her characters, Tiny Cat, in several sweet board books. In this little book, Tiny Cat dresses up as various animals and mimics their sounds. The first spread, shows Tiny Cat, grinning widely, saying "purr" as himself, a cat. He holds up rings to make big mouse ears, a long tube for an elephant nose, a tied-on beak for a bird, long boots for a horse, a brush for a porcupine, wraps himself in a carpet for a snake, gets tangled up in yarn as a spider... but this leaves quite the pile of things. Which come together to make a scary dragon! Luckily, Tiny Cat has one more animal, which doesn't need any disguise - a lion with a loud roar! Scharwz needs only a few lines and strokes to convey her mischievous and imaginative cat. While this isn't one I'd hand to actual babies, or even the average toddler who is unlikely to grasp the humor of the story, preschoolers are sure to adore it and with a caregiver to encourage sounds and their own dressing up, toddlers will catch on quickly. Verdict: I love Tiny Cat. You will love Tiny Cat too! This sweet story about a lonely girl making friends starts out well, but I didn't care for the ending. Rosie, a white girl in an old-fashioned village, is shy. She stands back as kids walk by in pairs and triples, fly kites, and play around the fountain. Outside the village is Rasmus, a pudgy green dragon with no wings. Rosie wishes the other kids would see her. Rasmus wishes he could fly. When Rosie wanders under his tree, he gives her a flower and they become friends, sharing their favorite things with each other. But when Rosie sees how sad Rasmus is that he can't fly, she sets out to find a way to help him. She tries many plans, but it's not until she gives him goggles and a scarf that he finally grows wings and can fly! The friends say a sad goodbye and Rosie is left alone again, this time with a flower to remember Rasmus by... until she sees another shy girl and offers her the flower, starting a new friendship. The soft, pastel art is very enticing for readers who like fantasy and warm fuzzy feelings. Most of the kids pictured appear to be white, and the small village is very picturesque with a blue sea in the distance and no cars or machinery in evidence, although the kids wear modern clothes as they freely run across the cobbles of the main square. On the one hand, most kids will just see this as a cute story about a dragon. On the other hand, several things about the ending especially bothered me. Rosie and Rasmus originally become friends because Rasmus makes an overture to her and they're both lonely. But their friendship quickly devolves into Rosie's efforts to "fix" Rasmus and help him fly and in the end he spontaneously sprouts wings. That feels like a weird call back to books like Heidi where the kids are friends with the "poor cripple" and they just magically lose their disability. There's no reason given for Rasmus having to leave - maybe he was imaginary all the time? On the other hand, there's also kind of an implication that he doesn't fit into their perfect little world in the village. I also noticed that the solitary girl Rosie makes friends with wasn't there in the first place - so maybe it isn't just that she needs to make overtures, but that she has to wait for the right time and the right person. Verdict: Kids probably won't pick up on all the things that confused/bothered me as an adult, so ultimately it's a sweet book with a nice message about making overtures to make friends. I would say it's an additional purchase. So much doggy fun! This is a delightful account of the training and testing of Piper, a three-year-old border collie who is learning to be a rescue dog at Crystal Mountain Resort in Washington. Rusch introduces readers to Piper and her friends and trainers and then her day begins. Readers will learn how Piper is trained, the science behind avalanches and dogs' abilities to smell, and the equipment and training needed to equip dogs and their handlers. The book ends with Piper taking - and passing - the test to be a real rescue dog. Back matter includes links to social media to follow the dogs, more information on dog training, and resources to learn about the science. The book has a picture book layout and briefer sentences/exclamations, as well as the framing story of Piper's day, but it's essentially a nonfiction book for older readers with large chunks of text. Photographs, graphs, maps, and facts are included throughout the book. Verdict: Rusch has a very readable style and this is a subject that is sure to fly off the shelves. Add this to your collection on working dogs and recommend it to third grade and up. I haven't been to this conference before - apparently it's quite a big deal in the early childhood educator world. It's pretty inexpensive, compared to most library conferences, and is at a local university. I wasn't sure how much it would apply to library work, especially since I already have my school colleague who does most of our early childhood storytimes, but I thought it would be a good opportunity to see ways the library can support our local early childhood centers, from daycares to four year old kindergartens. Conclusion - I'm glad I went, but once was probably enough, since I got the feeling a lot of it repeats. I was the only librarian at the pre-conference on Friday, but I did meet two other librarians from the Gail Borden library on Saturday (those in the library world may be familiar with this Illinois library as the one of the first to go to bisac/subjects and it's a pretty innovative - and massive - library.). Anyways. - Inevitably, I drove back and forth several times on the highway before deciding on an exit. Amazingly, I then quickly found the university, even with detours! - Robin Fox, a professor with a lengthy background experience in early childhood education, was the morning speaker. She talked about the changes in education, inclusiveness, policies, having difficult conversations, etc. After lunch, there were casual break-out sessions. I don't think these went too well since a lot of people seemed very much at a loss what to do without a facilitator, but I had some good conversations with a couple people, especially a teacher in a county next to ours and we exchanged several different library-related resources that I'll be following up on. - I then drove in CIRCLES for an HOUR trying to find my way out of the town. No, it is not a big town. I couldn't find the highway again! I finally found it, after an HOUR but I have no idea how. - Found the exit with no driving back and forth this time! - The keynote was... not for me. The speaker was someone who was apparently well-known in early childhood circles and she gave a very "inspirational" speech but I'm really not much on inspiration, I prefer practicalities. Other people seemed to get a lot out of it, but I personally thought there was no substance, just a lot of talk. And she incorrectly attributed several quotes from children's literature, including a Winnie -the-Pooh one, my particular bete noire. But, again, I wasn't really the audience for this. - Children and Play by Sandy Queen. Apparently this presenter has been presenting at the conference for a long time. I think it was the first time I've seen her though - very lively and personable, lots of stories, and some good information on the importance of play with ways to frame it. I think she was used to having longer sessions, as she kind of ran out of time at the end and I was sorry she had to end it - I could have listened to her longer. I'll be using things from this session in my work on our play areas and grant-writing, as well as how I frame/plan programs. - Secrets from your SLP by Tammy Myers. I was supposed to go to a different session, but I decided to be the rebel librarian and changed my mind and went to this one instead! I wasn't sure if you could do that or not, but apparently the only sessions that were completely filled were the, uh, essential oils and something else. So... yeah. Anyways, SLP does NOT mean what it means in the library world, it means speech language pathologist! The presenter did kind of put me to sleep - very soothing and somewhat monotonous voice - but she had really interesting things to say, especially in how we talk with/read to children and I'll be interested to incorporate some of her ideas, especially doing more matching and less identifying "this is red what else is red?" rather than "what color is this?" - During the lunch hour I checked out the vendor hall - they had a couple booths with puppets, toys, and the rest were things like the Registry and sponsors. Library exhibits are more fun lol. - Learning continues at home with Bev Schumaker - I was familiar with this person, she and her husband do learning games that many libraries circulate (I've got them in a list somewhere to add... sometime). This was super practical and useful, full of simple ideas for things parents and caregivers can take home to keep learning going. Lots of great recyclable ideas, things we can use for our activity table and/or in storytime. - Project Wild Child with Becky Bender and Sarah Nogee. Oh, how I wish our local kindergartens used this approach! These two amazing teachers take their early childhood and kindergarten classes out to the woods every Monday, rain, sun, or shine. So many wonderful experiences and ideas! I'm not sure how or if I can apply this to the library, but I'd certainly love for our outdoor garden space to be an exploratory space like theirs! Unfortunately, because it's right on a main road there are not only safety concerns but also issues with it looking "messy" since people drive by it. However, I really, really enjoyed this session. - Amazingly, I did NOT get lost leaving this time! I have no idea how, but somehow I magically ended up at the highway exit. So all's well that ends well. In some ways this was very different from a library conference. It was much more structured - people signed up for sessions ahead of time and I am pretty sure you weren't supposed to change (rebel librarian here though...). The educators have a lot of different concerns - much more attention is paid to policy, regulations, etc. I also noticed that there wasn't as much of the same "sharing" culture as I usually see in library groups - people stuck to their own groups and although I chatted with a few people it wasn't anything like a library conference. Especially before and after sessions, most library conferences people naturally (in my experience) chat to their neighbors and introduce themselves, but that's apparently not a thing for this. I also didn't see many people exchanging ideas as I'm used to.